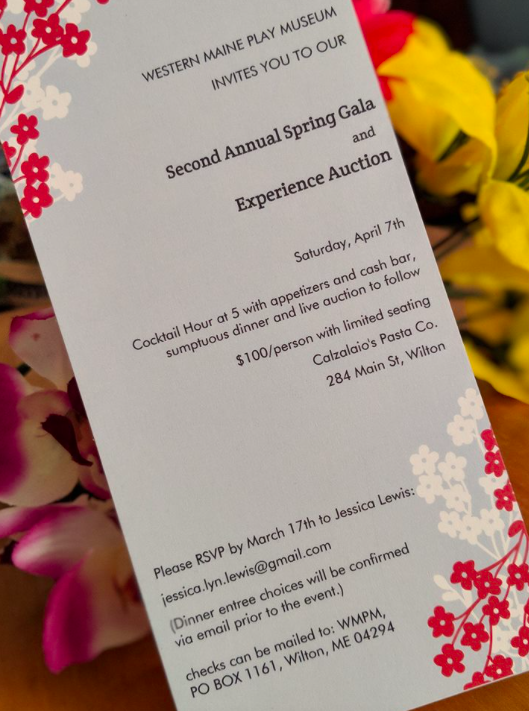 WILTON - Western Maine Play Museum's second annual Spring Gala and Experience Auction, an entertaining museum fundraiser, will be held at Calzolaio’s Pasta Restaurant on April 7. Cocktails will begin at 5 p.m with appetizers and a cash bar, followed by a dinner and live auction. Dinner entree will be confirmed via email prior to the event. Some of this year’s “Experiences” that will be up for bid include a ride in a private plane over Franklin County, and a 5 day Caribbean Villa vacation. Tickets are $100 per person, and seating is limited, so do contact Jessica Lewis jessica.lyn.lewis@gmail.com by March 17 to reserve your place. For more information about donating, purchasing naming rights to one of the rooms still remaining, and other ways you can help, check out the museum website: www.westernmaineplay.org or contact board vice-president Lori Lewis 645-3945, lorilewis@myfairpoint.net. Western Maine Play Museum is a registered non-profit with 501(c)(3) status. All donations are tax-deductible and gratefully received.